Hard on the heels of the news that Dell's “Project Ophelia” thumb PC is expected to ship this summer, thin client vendor Devon IT on Tuesday rolled out a similar contender of its own called the Ceptor. 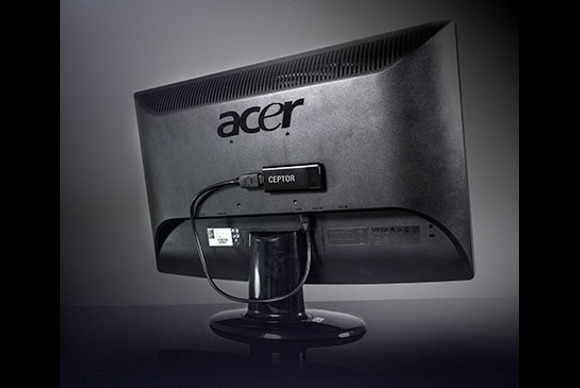 Like Dell's device, the $99 Ceptor is designed to plug into any HDMI-compatible display or monitor. Slightly larger than a USB memory stick, the multimedia-capable unit can then transform such a device into a “zero client” virtual desktop. Whereas Dell's device uses Linux-based Android, however, the Ceptor uses Devon IT’s own Linux-based zero-client operating system, known as ZeTOS, to let users access their virtual desktops. At the heart of the Ceptor is a dual-core ARM processor with ZeTOS preloaded. The device features integrated Bluetooth and Wi-Fi capability as well as USB on the go via a USB-B micro host port and 1080p HD video output. Users need only enter their user name and password to get up and running in a remote session. Devon IT’s Echo thin client management software platform, meanwhile, can be used to manage the client device. Ceptor runs in a stateless condition, Devon IT notes. Users can't execute software or initiate remote sessions that have not been authorized by an administrator. Ceptor devices also don't broadcast or auto-discover network protocols, thereby eliminating the need for special firewall or routing rules. Finally, since terminals don't have any local persistent memory, threats from viruses and malware are eliminated as well. Future versions of the Ceptor will offer even lower-cost processors and also run Android, Devon says. In the meantime, this could be another nice, inexpensive alternative for businesses to many of the Linux-powered tiny PCs we've seen arriving over the past year or so.